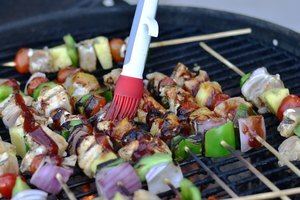 When barbecue season comes around, many people turn to the convenience of a chimney starter to light the grill. Although using this device can be convenient, it certainly isn't necessary. In fact, you might find it easier to start your grill without the use of a chimney starter. Adhering to a few simple rules will allow you to light your grill with only charcoal, lighter fluid and paper scraps---and without the time and fuss of preparing a chimney starter. Clean the grill, even if this is its first use. This will eliminate the possibility of any unusual tastes from compounds or chemicals from the factory making its way into the food. 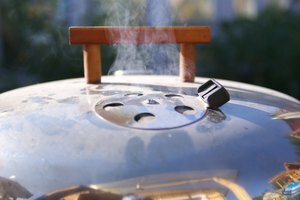 Otherwise, clean out any ashes or unburned pieces of charcoal, making sure that any vents on the underside of the grill are unclogged. Place several strips of either cardboard or rolled-up paper at the bottom of the grill; douse the strips with lighter fluid. These strips will act as kindling underneath the charcoal, helping the briquettes to reach maximum temperature and stay lit. Place several charcoal briquettes in the grill. The briquettes should be stacked in a conical pile, then covered liberally with lighter fluid. Light the charcoal briquettes. Use either a long-stemmed lighter or long strips of cardboard to light the charcoals. After the coals have been lit and every one of them is on fire let the pile stay lit and burning until the fire goes out by itself. When the flames are entirely extinguished, the coals should be gray in color and covered with ash. 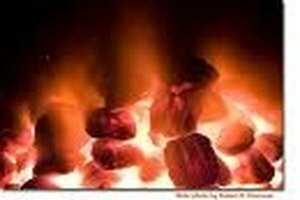 If the charcoals do not have that appearance, they should be ignited again. Spread the charcoal evenly across the bed of the grill in a single layer. Once the charcoals are spread across the bed, you're ready to begin cooking. Put the grate back in place over the charcoals and allow it to get hot before cooking on it. 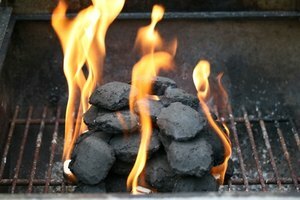 Article on setting up a charcoal grill from Food Network.